The Mini has long been a favourite car of mine, I had been a large muscle car lover for all my life – but the fast and light mini’s have always struck a chord with me for their potential to be a sporty car for low cost. I am not alone – since the first model was made in 1959 the car has become an icon of Britain and of the Motoring industry. People seem to love the small body shape and simple construction. This car takes me back to another time – what better subject for a model? 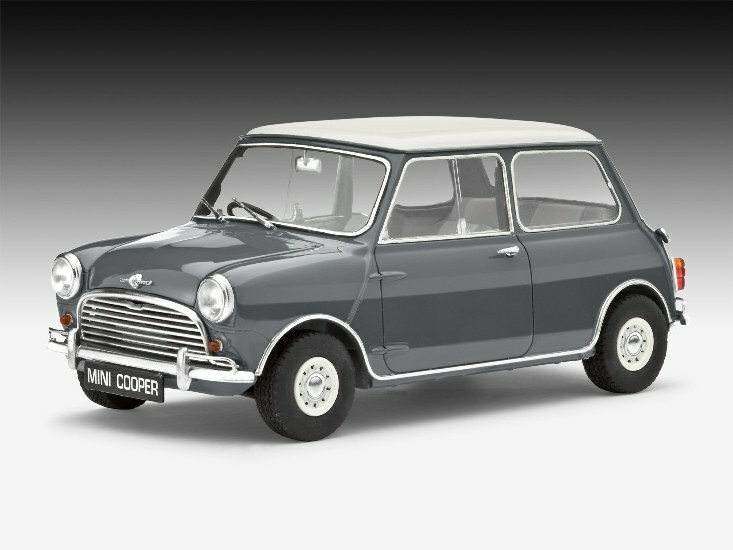 This kit from Revell is a new tool offering in 1/24th scale of the 1960’s classic 998 Mk.I Mini cooper. The box is the side opening style typical of their smaller kits; this contains five medium grey sprues, one transparent and two chrome plated sprues. Included in the box are decals for several cars, some rubber tyres and of course a detailed instruction booklet. The instruction booklet is a better guide than others I have read in the past from this company. The usual “comic book” style which jammed everything onto a few pages has been relaxed here, there are several equally divided sections here that are easy to read and follow. Kudos to Revell for making this easier for modellers - I hope they follow on with other kits in this style. The five grey sprues are of a good condition inside the plastic wrapping and are secured to each other so there weren’t really any scratches. There was a mark on the underside of the floor-plan – but that was minor. There is no flash really on the sprues and I cannot see any sink marks. The Chrome parts aren’t to everyone’s tastes – some prefer to spray on natural metal onto sprues rather than try to patch up the holes left after removal of the parts from sprues. I understand why, and it is a shame the injection marks aren’t in a place that wouldn’t scar the chrome. 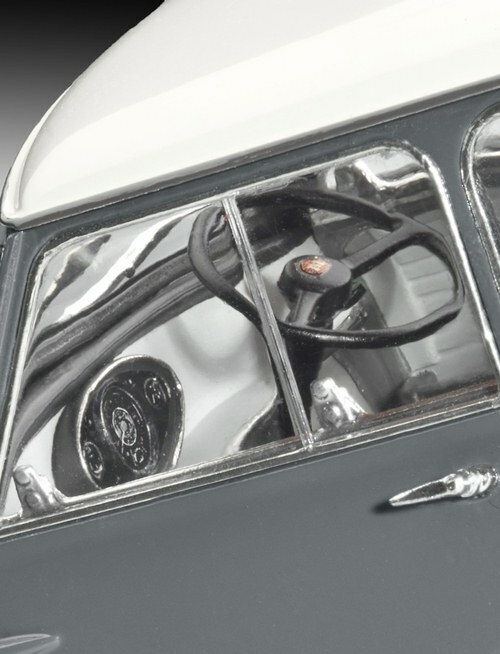 The parts in chrome are the lovely radiator grilles and deluxe wheels and the wing mirrors and things like the windscreen wipers. These will look great with care – and you can touch them up with silver pens if you have a spot of no chrome. If things get major you can remove the chrome from the sprues if you like and metal coat them yourself. The transparencies are clear and thin. The gentle curves are nicely represented here in plastic and the removal points are easy to sand over without scarring. Starting with the bodywork. The kit represents the small but perfectly curved mini very well. One thing I found was a line tracing along the front wing panels. There is a small plastic line on both of them that shouldn’t be there and will have to be removed. This won’t be a difficult fix as the line is on the peak of the front wing curve. 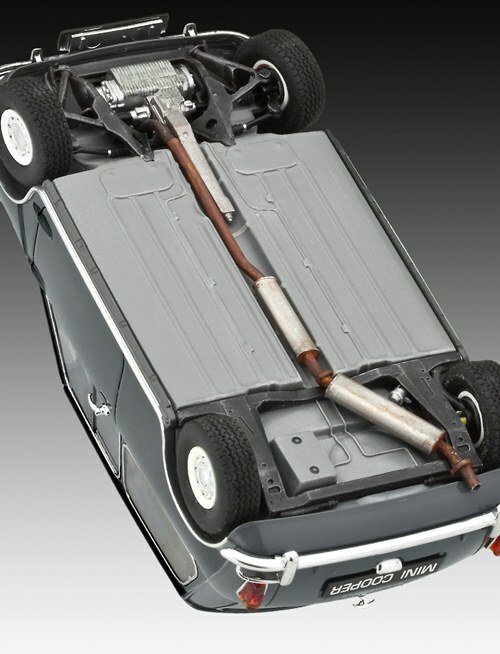 This is the only erroneous line or problem with the body, separate roof of opening bonnet and door panels I could see. There are injection marks but they are inside the frame and not at all seen by the eye - a good job on a rounded shell was done by the injection moulder. The insides of the car show off the plain but simple interior to good effect. The seats are striped and can be painted and detailed pretty easily. They sit on a frame on top of the interior body work which is joined together to create a “box” which sits inside the outside body shell. This system masks off any holes and gives you a simple and easy way of modelling a realistic interior simply. Simple construction makes you really want to get stuck in and make a start on the kit. The centre dash board has decals to represent the dials and the car’s pedals and steering wheel can be positioned on the left or the right hand side for the representation of several different countries. Interior handles, gear knob, steering wheel and pylon as well as the simple centre console are all there to detail up or to gloss over and quickly seal up depending on your choice of modelling. The engine is the other part we need to look at – coming in at 998CC (hence the name of this marque) This sideways layout of the four cylinder Cooper Works enhanced engine looks very detailed and only lacks some engine wiring which is simple to add. The exhaust is separate and simple construction. The tyres - well they are rubber but not too bad to me – I know some people can’t stand rubber tyres but these look like they will slip onto the chrome wheels and give a great representation of the real thing. There are several different types of vehicles represented in the decal choices. 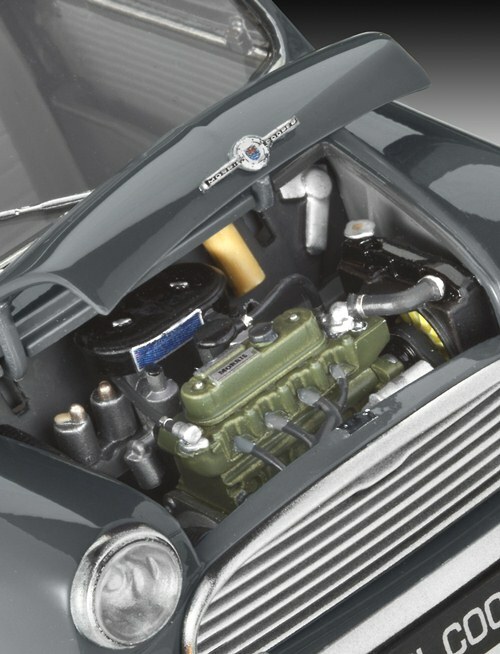 Options are given for both the Austin and the Morris version of the car. You could colour this car any of the classic colours to represent a period vehicle which would be my choice. The decals themselves are in register and printed clearly and the colours are true and strong. 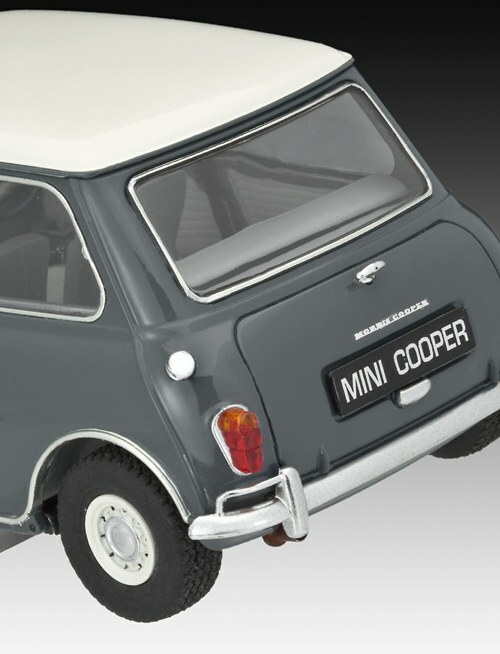 The body detail and the several different countries number plates and country stickers add a great touch to the decals and will make this popular around the world with modellers. Nice. 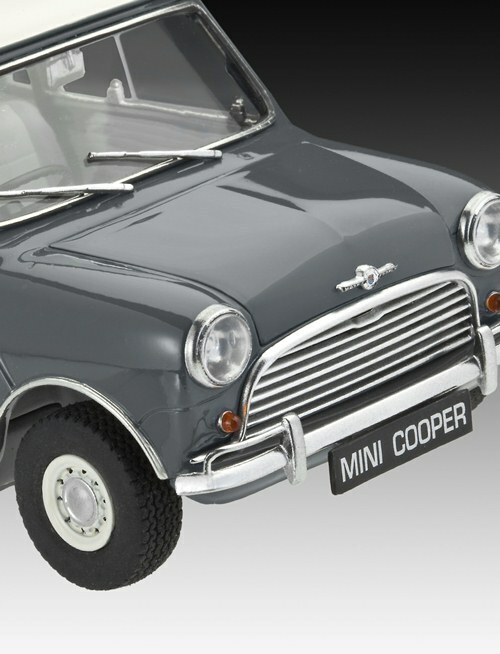 This new-tool model from Revell of the 1964 Mini Cooper 998CC Mk I give me reason to not build my Tamiya version in the Cooper Mini. I love the ease of construction and I can look past the chrome and rubber to see a really fun kit that will detail up very easily. I will have fun making this one!